Vermont’s Comprehensive Energy Plan is final. But that’s just the beginning. With the official goal of meeting 90 percent of the states energy needs from renewable sources by mid-century, meeting that ambitious target is the hard part. The state currently receives about 25 percent of its energy from renewable sources. Despite a legislative mandate, it has been more than a decade since the state produced a comprehensive energy plan. Now, three months, thousands of comments and more than 18 meetings later, the final version is out. At a press conference Thursday, Gov. Peter Shumlin, Agency of Natural Resources Secretary Deb Markowitz and Commissioner of the Department of Public Service Elizabeth Miller fielded questions on the more contentious recommendations in the plan. Shumlin emphasized the importance of shifting to a more diverse portfolio of renewable sources of energy. He accented the importance of creating more “green” jobs in the state. “I am convinced that if Vermont can begin to get off our addiction to oil, it is going to create jobs and economic opportunities in the state,” he said. A lot of the changes in the plan, Miller said, were simply matters of “scrubbing” the final version. As with the draft plan, which was released in September, the final plan is heavy on efficiency measures. ANR Secretary Deb Markowitz said the agency’s current policy has enough flexibility to permit projects that are appropriate and consistent with the use of the land. If there was a place where all of the issues the agency looked to were met and it was consistent with the purpose of the land’s use, “there is probably enough flexibility to go for it,” she said. The idea, Miller said, is that state lands have equal treatment of all renewable energy under existing criteria. Department of Public Service Commissioner Elizabeth Miller announces the release of the final version of the state's Comprehensive Energy Plan. Like the draft plan, the final plan also declines to take a stance on whether the Vermont Yankee Nuclear Power Station should remain open, which is the subject of a pending lawsuit. Another aspect of the plan that did not see much change is the treatment of energy from large hydroelectric facilities in Quebec. Under state law, any hydroelectric energy qualifies as “renewable” starting in July 2012. Other New England states require that only smaller hydroelectric projects can qualify as new renewable sources for purposes of renewable portfolio standards. Environmental groups had expressed concerns about the possibility of allowing energy from Hydro-Quebec to qualify as new renewable sources in a renewable portfolio standard. The governor also addressed the proposals in the plan to include biomass as a renewable source. He said the state is not taking anything off the table, but he was least enthusiastic about biomass of all the renewables. Primarily, this is because there are questions about the capacity of the state’s forests to supply a large biomass facility. The plan also still includes a recommendation that the state should consider construction of a small- or mid-sized natural gas electric generation plant, an issue that drew some criticism during the comment period for the draft plan. For lawmakers looking toward the upcoming legislative session, the plan lays out the state’s goals for the long term. For the upcoming session, Klein said, lawmakers will be proposing specifics that lead to that goal. For example, Klein, who chairs the House Committee on Natural Resources and Energy, plans to introduce legislation that would roll the state’s Sustainably Priced Energy Enterprise Development program into a mandatory renewable portfolio standard. The SPEED program promotes renewable energy development by encouraging long-term contracts for electricity from renewable sources. Currently, the program is not mandatory. Klein’s bill would expand the requirements of what utilities will have to have in their portfolios. It would acknowledge energy from Hydro-Quebec as renewable with the caveat that to be considered new renewables, projects must be on line after 2005. The legislation would also lift the 50 MW cap on the state’s standard offer program which locks in rates for certain renewable projects. Paul Burns, executive director of the Vermont Public Interest Research Group, attended the governor’s press conference Thursday. He said the environmental advocacy group was generally supportive of the final plan. Burns said at this point it is more a matter of arguing about the details in the margins. For example, VPIRG is not a fan of Hydro-Quebec being considered renewable, but the group’s major concern is with how the state is going to develop renewable resources in the state. Not everyone has been so thrilled by the state’s proposed energy future. 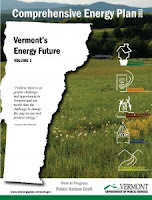 Guy Page, communications director for the Vermont Energy Partnership, said he has not yet seen the final plan, but the division in energy policy goals goes beyond the document. He said the state’s decision to shutter Vermont Yankee will result in higher electric rates and less reliable power. The partnership represents a coalition of businesses that oppose the plant’s closure. Utilities plan to replace a large share of the energy that currently comes from Vermont Yankee with nuclear power from New Hampshire’s Seabrook Nuclear Power Plant and Hydro-Quebec. Page says, however, some replacement energy at least in the short term will come from baseload fossil fuels from the regional grid. “What we’re saying is use VY as a buffer in a clean, controlled, low-cost reliable way to transition to Vermont’s energy future of renewables,” he said.